". . . Where is the one who has been born king of the Jews? We saw his star in the east and have come to worship him." (Matthew 2:2). The Star of Bethlehem Diamond Cross Pendant. Made in 14k solid yellow gold with a single solitaire diamond representing the birth of Christ. Cross measures 3/4" (19.5mm) tall x 1/2" (12.5mm) wide. Diamond weighs 0.02 Carats in high quality, full-cut G-H Color, SI1 Clarity. Gold weighs approx. 1.08 grams. 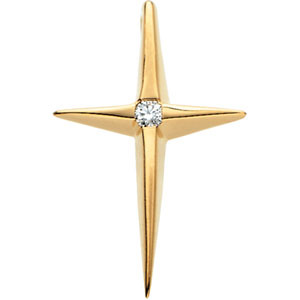 We guarantee our Star of Bethlehem Diamond Cross Pendant, 14K Gold to be high quality, authentic jewelry, as described above.